Learn from the best to become a Laserfiche Expert! Master the art of scanning and image processing as you learn to use captured content with forms, documents, and data. Manage record lifecycles from start to finish. File, retain, transfer, and store records with Laserfiche to stay in compliance. Keep things running smoothly. Digitally transform your organization with the help of Laserfiche Forms and Workflow. Get Laserfiche up and running at your organization. Set up, support, maintain, and secure your Laserfiche system. Become the resident Laserfiche expert in your office. Learn how to capture, process and store content with Laserfiche. Take your knowledge further. Become the ultimate power-user as you configure and troubleshoot robust Laserfiche systems. 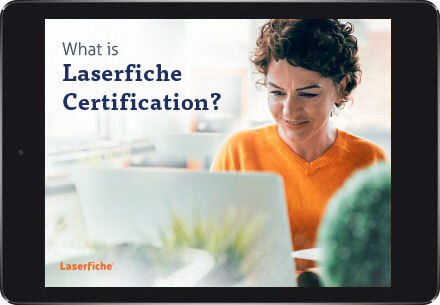 Find out why industry leaders choose to invest in the Laserfiche Certification program to grow their usage of the system and transform their workplace experience. Learn the basics of ECM with Laserfiche. Aprenda los conceptos básicos de ECM utilizando Laserfiche. Expand your knowledge of installing, configuring and managing Laserfiche.